The Mazda CX-5 offers daily commuting fun with an engaging performance and money-saving value with impressive mpg ratings. Top this off with a good looking package that's sure to grab attention, even in a crowded grocery store parking lot, and it's easy to understand why CX-5 is considered a top choice in the compact SUV class. Plus, this year it arrives with a more powerful engine, added safety technologies and new entertainment options. See the rest of our 2014 Mazda CX-5 review for more details. The five-passenger 2014 Mazda CX-5 is on sale in Springfield, Missouri and is offered in Sport, Touring and Grand Touring trim levels. Both Touring models get a bigger engine for 2014, stepping up to a 2.5-liter four-cylinder with 184 horsepower. The Sport carries over with the same 155-hp engine from last year. Amenities include an iPod/USB interface, cruise control, remote keyless entry, full power accessories and air conditioning, among other features. Every model is also now available with Pandora and HD Radio, which are new for 2014, along with the optional Smart City Brake Support system, an all-new collision warning and mitigation feature. 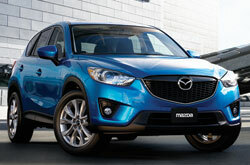 The SKYACTIV TECHNOLOGY-equipped CX-5 has arrived at Reliable Mazda and local shoppers can find it on our lot today! We have a large selection with several colors and options to choose from. 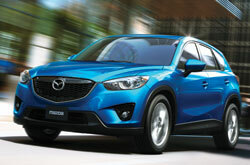 Visit to test drive the new Mazda CX-5 in Springfield at 438 S. Ingram Mill Road. Browse our site for information about current lease and finance incentives, or call to speak with a financial representative today. 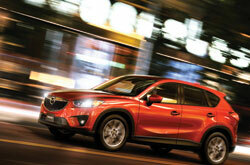 For additional vehicle information, please continue reading Reliable's Mazda CX-5 review below. Along with a list of useful specifications, a video tour of the SUV is also included at the bottom of the page. The 2014 Volkswagen Tiguan, Toyota RAV4 and the Chevrolet Equinox are no match for the 2014 CX-5! Just compare Mazda's newest model alongside them and you'll learn that it beats out the competition easily. MO shoppers will be pleased with the CX-5's convenient features and low MSRP. 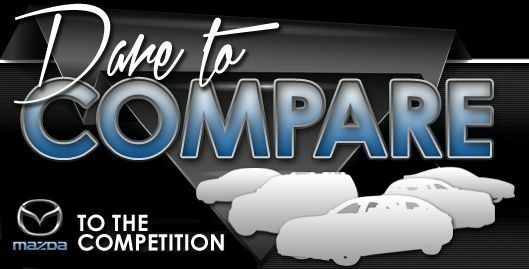 Many drivers in Springfield choose it because it's a phenomenal value; compare its price to the vehicles listed above to see for yourself. The bullet list below this text will give you even more details! Reliable Mazda's automotive writers have taken the time to post reviews of the Mazda CX-5 and other 2014 models to help make your next car search simpler. Not all Springfield car dealers are alike. We differ from others in that we feel it's our mission to provide customers with quality reviews. You can rely on the information in this article to be factual and provide you with the details you need to [decide] if you want to take home the CX-5. Is the CX-5 not right for you? Use our Mazda reviews and car comparisons to learn about other attractive vehicles available at Reliable Mazda.